The Gippsland Lakes are 400 square kilometres of beautiful lakes & rivers making it Australia’s largest inland waterway. Separated from the ocean by the coastal dunes known as Ninety Mile Beach, the Gippsland Lakes is the jewel in the crown of East Gippsland. The 3 main lakes are Lake King, Lake Victoria and Lake Wellington and they are all fed by rivers that originate from the High Country and include the Nicholson, Tambo & Mitchell. The Lakes include small islands and are surrounded by two National Parks – the Lakes National Park and Gippsland Lakes Coastal Park, both offering terrific walking tracks, wildlife & fauna appreciation & boating destinations. The lakes offer excellent year round cruising conditions, with large areas of open water and secluded inlets and rivers to explore. 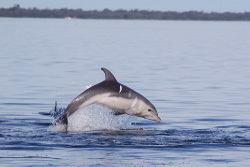 The Gippsland Lakes are home to abundant bird, marine & native animal life with dolphins, pelicans, koalas, echidnas & kangaroos inhabiting much of the Gippsland Lakes region. 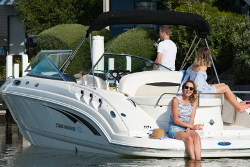 Whether you paddle, sail, motorboat, ski, wakeboard, tube, jetski, prawn or fish when you stay at Captains Cove we will ensure you have all of the boating knowledge you need. Our in room information has recomended swimming spots, watersport locations & we can also provide you with a cruising map. Bunga Arm also on the 90 mile beach, it is one of the most beautiful parts of the Gippsland Lakes. Only accessible by boat you will find a pristine stretch of dune that separates the lake & ocean. 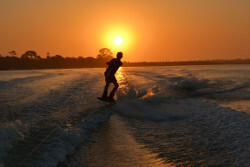 The location offers a waterski area, excellent beach access & peace & quiet. Beach moorings are spread along the shore line and public toilet facilities are located at the camp sites. 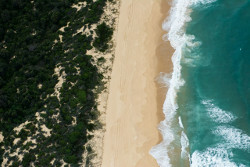 Lakes Entrance is where the Bass Strait meets the Gippsland Lakes. A populat location for crabbing. Lakes Entrance offers mini golf & access to the 90 mile beach by footbridge. 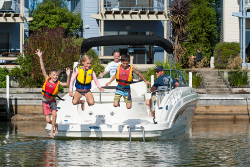 If you bring your boat to Captains Cove we challenge you to leave the car in the carport for you stay. Go to dinner by boat, get the bread & milk by boat & explore the best parts of Gippsland in your boat.